For the past few months, particularly before the English reached Indian shores (this time), pundits were obsessed with a few things which don’t seem so important any more. In fact you could call them shattered myths. Rank turners and dust bowls – there haven’t been any. The five pitches have perhaps been as fair as any team has been offered in about 10 years. Pitches don’t get any better in India. The first innings scores have been testimony to that. 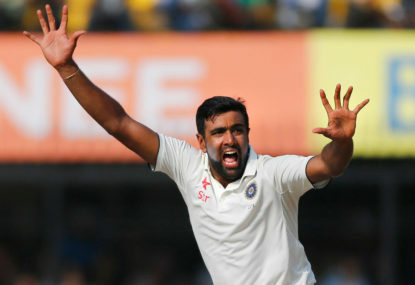 Cook’s dominance against spin – between Ravi Jadeja and Ravi Ashwin, Cook, otherwise a good player of spin, has been made to look pedestrian, and one occasion when he was bowled through the gate by Ashwin. Stuart Broad and Jimmy Anderson’s ability to bowl the opposition out on the most unresponsive of pitches – Anderson has been pedestrian, and Broad, semi effective at best, on the rare occasions he has not been injured. But the biggest one of them, was: lose a toss in India, and you lose the match. That has not only been shattered, but ground to dust beneath the collective boots of India’s batting order. On four occasions out of five, lady luck has not favoured Virat Kohli. On four occasions out of five, Alastair Cook has batted first, following conventional wisdom. On three of those four occasions, Cook’s boys have scored over 400, batting first. None of those numbers are anything to be scoff at. And yet, England is down 3-0 and in real danger of losing the series 4-0 when the Fifth Test at Chennai comes to a close. If England does lose this Test, and if it does lose it by an innings (which is not completely unlikely), it would in fact be the first time in the history of Test cricket that a team loses by an innings after scoring more than 450 in the first innings. This Indian team has turned a lot of conventional wisdom on its head. It has been a very interesting series indeed on several counts for those who have followed it. You can call the Indians hometown bullies. You can call them unbeatable on their own turf, and lame ducks abroad. It’s your right. You can question Ashwin’s effectiveness abroad and choose to ignore his place as the premier all-rounder in the world today. It’s your right. You can opine that Kohli will fall apart in England when India go there next time, and continue to say he is not in the same class as a Root or a Smith or a Williamson in Test cricket, despite everything he has done this series. It’s your right. But you can never say again that a team cannot win in India if they lose the toss. That’s a myth that lies forever shattered.